Hello friends and kind visitors! 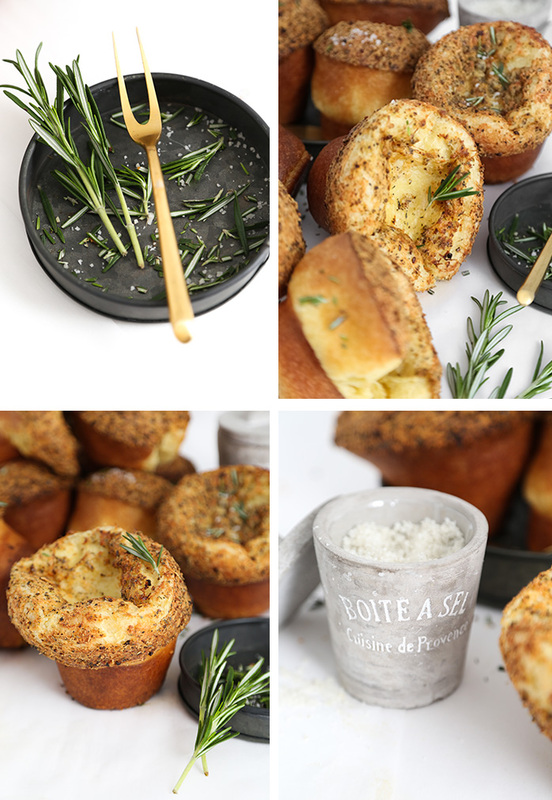 I'm taking a break from sweets today to share with you the best savory popover recipe I've ever tasted. I make these rolls almost weekly. All of my previous attempts at popovers have been lackluster at best, either too bland or not enough rise. 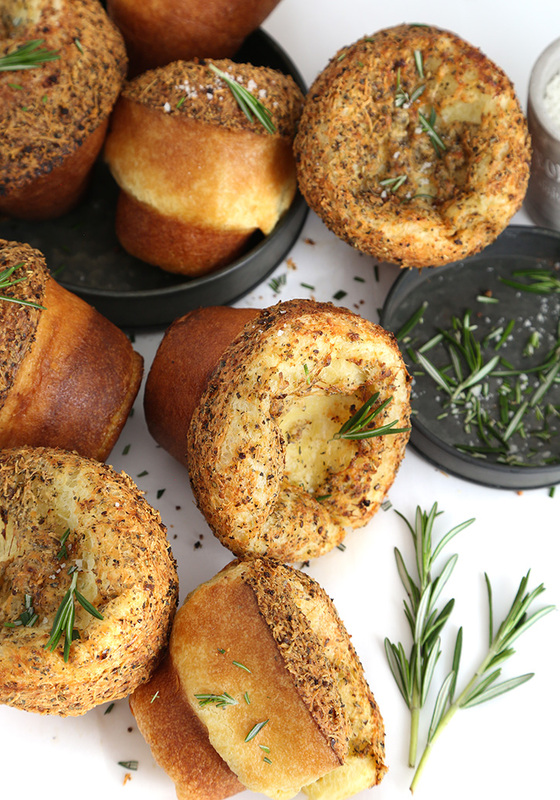 I was beginning to think I just didn't like popovers, but this recipe was a real game-changer! The batter is simple to mix, but you will need to plan ahead because a resting period of one hour is required before baking. I only have one popover pan with 6 cavities, which is not enough to hold all of the popover batter this recipe yields. I found that two jumbo muffin tins (6 cavities each) are perfectly acceptable replacements, and I almost prefer them to the popover pan. Before baking, the batter is generously topped with a Parmesan, garlic, and dried Italian herb mixture. As you divide the cheese mixture among the batter in the tins, you'll probably think, 'wow, this is far too much topping!' - but trust me, it's not. All that cheesy goodness is essential to forming the crusty, crunchy cap that develops on top of each roll. The batter goes in quite flat, and magically inflates in the oven. The rolls become huge, and I can best describe the size and shape of a baked roll as something akin to a small terracotta flower pot! These are good on their own, but a pat of salted butter in the center of a warm popover is especially good. I also recommend serving them with marinara sauce, or as a side dish on spaghetti night. We also like dipping them in a shallow dish of seasoned olive oil and balsamic vinegar, just as you would a loaf of good Italian bread. 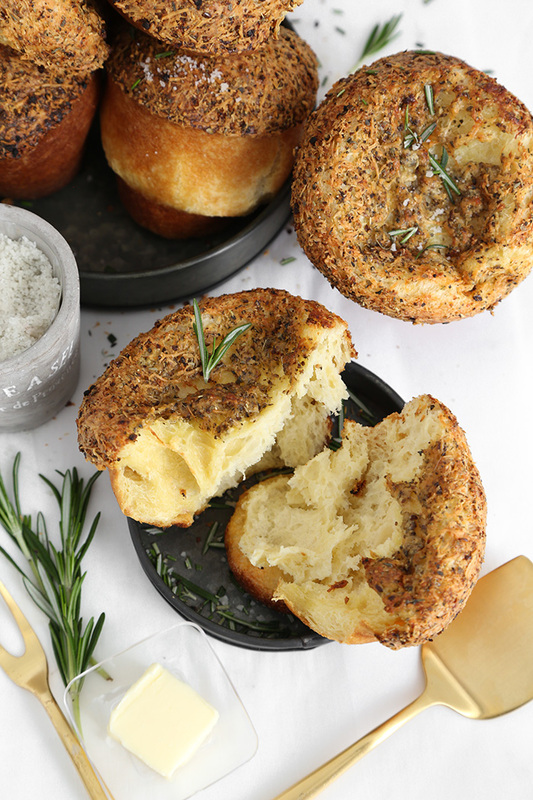 If you don't have popover pans, use jumbo muffin tins instead. Using the muffin pans will yield 9 rolls instead of a dozen. Don't open the oven as these bake or they may deflate and never reach their full 'pop'! Place the milk in a saucepan and heat until just warm, about 110°F. Remove from heat. In a large bowl, sift together the flour, salt and baking powder. Place the eggs in the bowl of an electric mixer fitted with the whip attachment, and beat on medium-low speed until pale and foamy, 3-5 minutes. Pour in the warm milk. Add the flour mixture in 3-4 additions, beating on low speed until just incorporated. Increase speed to medium and beat 2 minutes. Cover the mixing bowl with a dish towel and let rest, unrefrigerated, for one hour. Mix the cheese, herbs, and garlic in a small bowl. Grease the cavities of 12 popover cups (2 pans), or 9 cavities of jumbo muffin tins. Place the pans on a large baking sheet. Cut each tablespoon of butter into four pieces, so that you have 12 small square pieces of butter. Fill the prepared pans with the popover batter within 1/8 inch of the top of each cup. 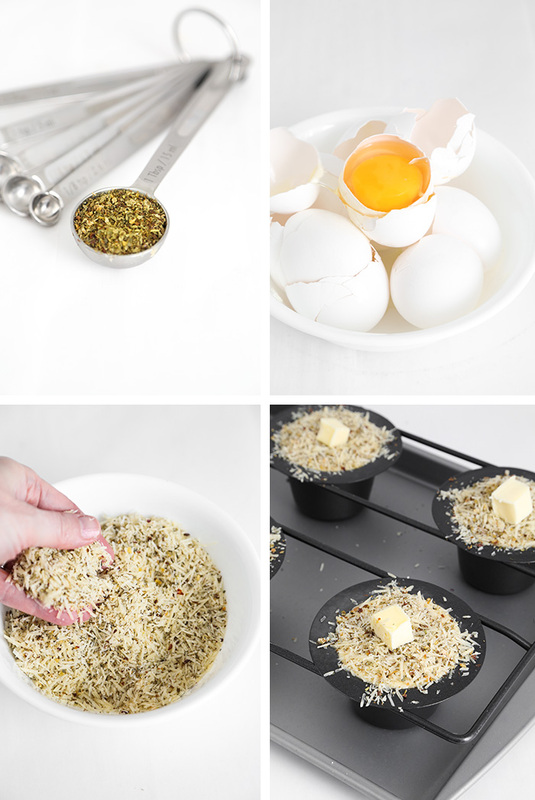 Generously divide the cheese-herb mixture among the filled cups. Place one square of butter (1/4 tablespoon) in the centers of each cup. Bake for 15 minutes at 450°F; reduce the oven heat to 375°F and bake for 30 minutes more. 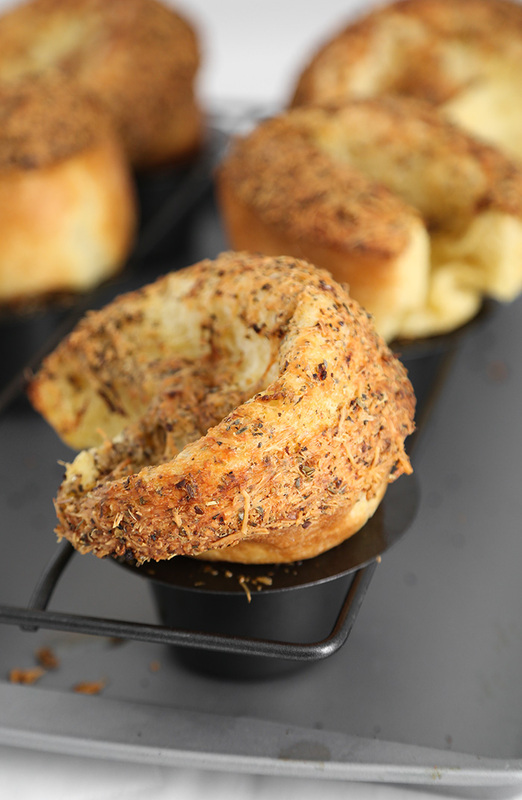 When done, the popovers should be well-inflated, and have a golden brown exterior with a crisp-looking top. Serve warm with salted butter, or a side of marinara, or with seasoned olive oil and balsamic vinegar for dipping (or all three!). Love Popovers! Can't wait to try this recipe. Excited to make these! I love a good popover recipe. These look amazing! Thanks for the links on the pans -- I think my husband would flip if I got another pan, so I would need to smuggle it in the house, lol. But popovers are too pretty to not have the official pan! Can't wait to try and that topping looks amazing! Carissa - haha! I'm also a member of the pan smuggling club. Oh, how I love popovers. I used to have 2 popover pans, but got rid of them since I stopped making them at home, for some odd reason. I'm going to have to test out a cupcake pan with your delicious recipe here! Sounds delicious! Can you use muffin papers to save your pan or will that mess up the baking? Hi! Good question. Skip the muffin papers for this particular bread recipe. The thin batter needs to be able to climb the sides of the pan during baking. If you use flour-based baking spray in your tin, there's almost no mess or crumbs left in the pan after you turn the popovers out. I hope this helps! 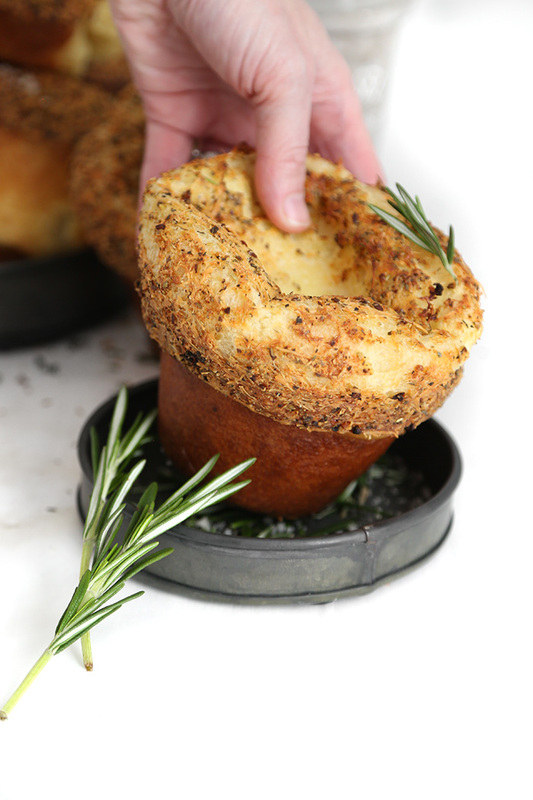 I have been making a Rosemary Parm popover that is wonderful (according to my family). These sound like it is right up my alley so I am going to try them. These look amazing, and are definitely going on my 'to-bake' list! Do they travel or reheat well, or must they be eaten as soon as possible?